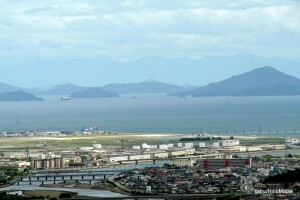 Iwakuni is more than just Kintaikyo. 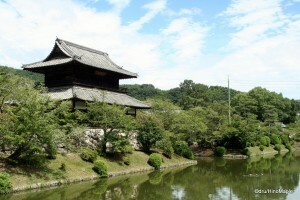 The area around Kintaikyo is dominated by Kikko Park as well as Iwakuni Castle which rests at the top of a small mountain. It would be a big waste of time to head out to Iwakuni just to walk over Kintaikyo, grab a snack, and then return to Iwakuni Station. I’m sure there are a few people who are like that but I love to explore and find new things and to also try and find things that few people would ever venture onto. Kikko Park is one such place where many people don’t really venture to, but it is a beautiful park that can take a full day to explore. It is full of beautiful cherry and maple trees that make the park, and in return Kintaikyo, a beautiful place to visit in both the cherry blossom season as well as the autumn foliage season. The history of the region is also interlaced within the park itself as there are several statues and historical sites throughout the park. Kikko Park is also a good opportunity to enjoy oneself with many of the locals as they tend to enjoy visiting the park when they have the free time. 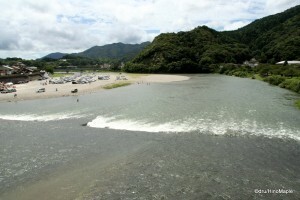 After you pass Kintaikyo, you will be in Kikko Park. Kikko Park is a large area that can be accessed from bridges flanking its sides but most tourists will enter Kikko Park from the main entrance, Kintaikyo. After you pass Kintaikyo you have to pass a few shops hawking several food items before you reach the park itself. The park is very lovely but it is geared more to locals than tourists. At the main entrance is a statue of Kikkawa Hiroyoshi. He is the lord who commissioned the building of the very first Kintaikyo, which was subsequently destroyed by a flood a year after being completed. While he commissioned the first bridge, he is also the one who set up the current system of maintaining the current version of Kintaikyo that we see today. Once past Kikkawa the park becomes a park. The park has lots of vast open green spaces with lots of grass. As you explore the park you will run into many historical places. The closest one to the main entrance is the Gate of Kagawa Family Residence. It is a small residence with a beautiful garden inside. There is a nice area to sit down in the shade and a few cats also take up residence in the shade. The garden has several rose bushes among other flowers but unfortunately when I visited the garden looked a little unkempt with a few weeds growing in the gardens. The few flowers that were still holding on were very nice and I could only imagine how beautiful the garden actually was when most of the flowers were in full bloom. Behind the Kagawa Family Residence is where the park has a lot more potential. There is a statue of Kojiro Sasaki, a swordsman who was legendary, or a legend, in the early Edo period. From what I can gather he was born in Fukui but information about why his statue is in Iwakuni is a little difficult to come by. Kojiro Sasaki is a famous for his swordsmanship and a famous tale about a duel he had with Miyamoto Musashi. His statue in Kikko Park is located in front of a large iris garden. In fact Kikko Park has two iris gardens and a Japanese garden on the east side. Unfortunately during my visit to Iwakuni, the irises were not in bloom so the gardens were not as beautiful as they could be. I can only imagine the beautiful purples coming from the flowers in spring but with my trip being in the summer, I had to make do with the open water instead. These gardens are located on the east side of the park along with a couple museums, Kikko Shrine, Kinukaku Pavilion, and a Noh stage. While I never visited the museums, the shrine, pavilion, and stage are nice places to visit. Kinukaku Pavilion is stunning within its surroundings and makes for beautiful pictures but the shrine and stage are not too special. The pavilion itself is not very special when you walk right up to it but it is a very peaceful area of the park. The busiest area of the park is the central area between the main entry way and the ropeway to head up to Iwakuni Castle. 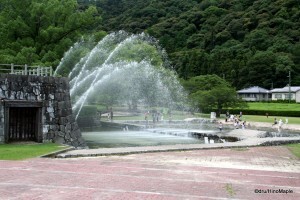 This area is dominated by a huge field of grass and scattered trees as well as a huge fountain. This huge fountain is often used by locals in the summer as a free water park and it is hard to escape the screams of young kids running around having fun. On a hot summer’s day it is hard to resist the water and I definitely dreamed of jumping in with them. My only problem was that I was carrying some expensive cameras as well as a phone that would not be very happy if I jumped into the water. I digressed and dreamed of the fun I could have had if I had a friend to watch my things as I acted like the other 3 year olds running around in the water. For people who want to learn something, the central area of the park has a couple of interesting sights. 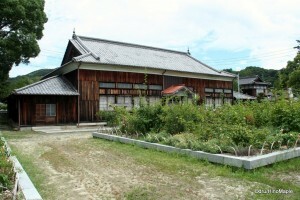 The Former Mekata Residence is an old house that you can walk around. It isn’t very special and I found it to be a bit decrepit. Next to the residence is the White Snake Conservatory. Kikko Park is well known for their white snakes and the conservatory has several white snakes on display. This may sound like a nice place to visit if you like snakes but aside from a few displays showing preserved snakes, some snake skin, two adult snakes, and several young snakes, the conservatory is not a place you need to visit. The conservatory requests donations of 100 yen to visit and I thought admission was 100 yen. For 100 yen, you get to walk around a very small room to see a few things and then walk out right away. It takes roughly 1-2 minutes to see everything but in reality the 100 yen I spent was more for the raising of more snakes rather than the ability to see them. Heading to the west side of Kikko Park leads you to Momiji Park. Technically the translation of the Japanese is Maple Valley Park but sometimes simple is better. This area of Kikko Park is very nice as once again most people don’t take the time to venture to this area. Most people tend to head straight to Iwakuni Castle. Momiji Park must be a beautiful place in autumn when the maple leaves change colours but when I visited in the summer, the leaves were just a beautiful green. The first thing you will see as you enter Momiji Park is the Kikkawa Clan Cemetery. It is a very interesting cemetery as most cemeteries for feudal lords are closed off. The Kikkawa Clan Cemetery was surprisingly open for the most part and you can easily walk up and around many of the famous heads of the Kikkawa Clan. As you continue west, up a small hill, you will cross Yokouji Temple then you will quickly reach Rokkaku Tei. 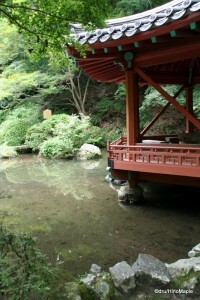 Rokkaku Tei is a Chinese styled gazebo that is tucked into the corner of the park. It is very easy to miss and the Momiji Park area is actually a lot smaller than you would expect. Rokkaku Tei is a nice little gazebo that would be a lot better in autumn and perhaps a little less “scary” as there is a small pond next to the gazebo that had thousands of tadpoles inside it when I visited. It is nice to visit the west side of the park. It is also the only way to the youth hostel in Iwakuni and the entrance to the road and hiking trail up to Iwakuni Castle. For those who walk over Kintaikyo, you can buy a set of tickets that includes a round trip ticket on the ropeway up to Iwakuni Castle as well as admission into Iwakuni Castle itself. The ropeway doesn’t run often on weekdays but on holidays it runs continuously as it is often filled to capacity. The top of the ropeway is home to a large clock, a concert area, and beautiful views of Iwakuni. There isn’t a lot to see around the ropeway station so it is best to just head straight up to the castle itself. There are two routes up to the castle. One route traces a path around the back of Iwakuni Castle while a road takes you most of the way to Iwakuni Castle before you head up some stairs. Iwakuni Castle itself is a very quaint little castle that was similar in size to other small castles such as the ones you find in Kochi or Matsue. Having visited 4 original castles and 4 rebuilt castles, Iwakuni was not as interesting as it could have been for me. 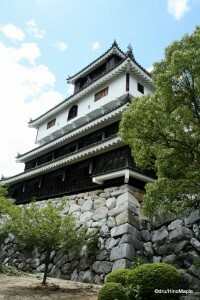 When visiting a Japanese castle, it is important to visit an original castle rather than a reconstruction. While reconstructions are very nice on the outside, they can be very boring on the inside. They tend to be built out of concrete with a fake wooden façade on the outside. They usually have museums built inside with interesting exhibits but they tend to not be worth it after one or two castles. Original castles are always worth a visit as they have all of the original work and defense ports. Iwakuni did a good job with their reconstruction but they did one thing that ruined the castle completely. In order for people to enjoy the views of Iwakuni, they place modern windows on the top floor of the castle so that tourists could safely look out over the city. I didn’t notice it until I reached the castle keep and ever since then the castle never looked as beautiful as I had originally thought. It is still a beautiful castle and I understand the need to put safety measures in as children do enter the castle, but at the same time it would be nice if they could make it more historically accurate from the outside. This is something that a lot of rebuilt Japanese castles have and the worst example is Osaka Castle which has a gaudy glass elevator on its side. Thankfully Iwakuni Castle is not as gaudy and the windows don’t take away from the castle too much but it isn’t something that I like. My trip to Iwakuni was a very pleasant trip and I really enjoyed going there. Kintaikyo and Kikko Park are very beautiful places. I wish I wasn’t so rushed in my trip but there really isn’t much I can do when I had to get back to Tokyo on the same day. Be prepared to travel with many people as the train to Iwakuni is a bit busy until you reach Miyajima. After Miyajima the train is empty and you won’t have any troubles getting a seat. The bus can be a little crowded depending on which bus you can get. I was unfortunate enough to get one of the “neighbourhood” buses that could only hold about 20 people. I had to stand on the mini bus for about 20-30 minutes till we got to Kintaikyo. Spending money on the set tickets to go across the bridge and up to Iwakuni Castle is worth it. It is lovely up there with great views of the US Marine Base. Be sure to stop off at the entrance of Kikko Park before you return over Kintaikyo to the bus depot. There are two famous shops. One shop sells Minced Katsu. Minced Katsu is minced meat deep fried into a patty. Then there is the soft serve ice cream. The main shop boasts selling 100 types of soft serve ice cream. I had the pleasure to try the watermelon ice cream and it was delicious. There is nothing better than a nice cold ice cream after a day of walking in the heat. The watermelon was very refreshing and I couldn’t have asked for anything more to end a wonderful trip. This entry was posted in Chugoku and tagged conservatory, Former Mekata Residence, fountain, Fukui, garden, Gate of Kagawa Family Residence, gazebo, Hiroshima-ken, Hiroyoshi, iris, Iwakuni, Iwakuni Castle, Iwakuni Station, Iwakuni-jo, japan, Kagawa, Kagawa Family Residence, Kikkawa, Kikkawa Clan, Kikkawa Clan Cemetery, Kikkawa Hiroyoshi, Kikko Jinja, Kikko Park, Kikko Shrine, Kintai Bridge, Kintaibashi, Kintaikyo, Kinukaku, Kinukaku Pavilion, Kojiro, Kojiro Sasaki, Marine Base, Mekata, Mekata Residence, Minced Katsu, Miyamoto, Miyamoto Musashi, Momiji Park, Musashi, Noh Stage, Rokkaku Tei, Sasaki, Soft Serve Ice Cream, US Marine Base, White Snake, White Snake Conservatory, Yamaguchi, Yamaguchi-ken by Dru. Bookmark the permalink. I’ve never been in this part of the world (only Hiroshima), but I always enjoy reading about parks and history and whatnot. Thanks for the compliment. I prefer the ice cream though. 🙂 BTW, did you notice the plane taking off from the base in the gorgeous view photo? Yup. Kojiro had a few problems in that duel. However, if my memory is still in tact from the research, Kojiro’s history is still somewhat unknown.